Herbert was born in Bexleyheath in 1898, a near-perfect date for him to be drawn into WW1. His parents were George 1863 of Hockliffe and Elizabeth nee Clark. I do not yet have a reason for George’s move to London, but he married Elizabeth in Dartford in 1887 and in the 1911 census George and Elizabeth were living at 115 Broadway, Bexley Heath, Kent, where he said his occupation was a florist. It is likely, then that the location was a flat above a shop. 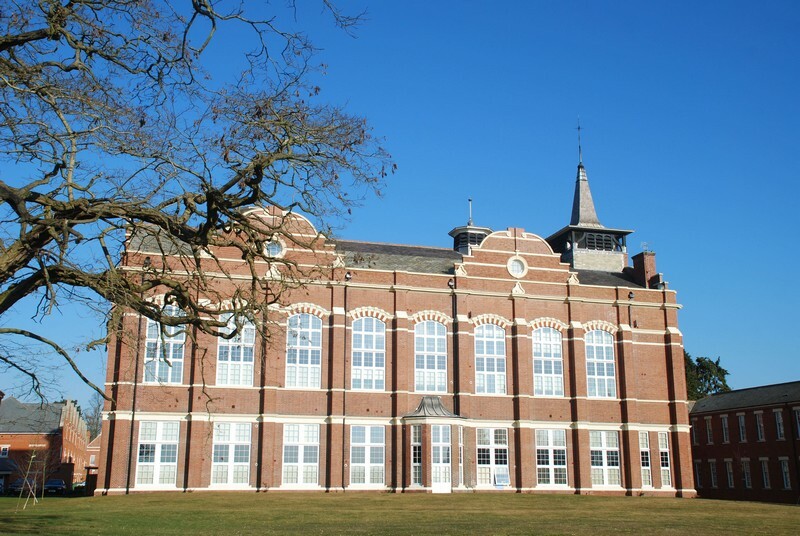 When he died at 87 years old, it was in a place called The Grange, in Bloomsfield Rd, Bexley Heath, Kent. His will named his executors as Frank Tearle, Company Director, and Herbert John Tearle, Builders Merchant, so his family has followed their father’s interest in small business. His parents were Jabez 1841 of Hockliffe and Mary nee Clarke. Jabez traces his ancestry back to John 1741. 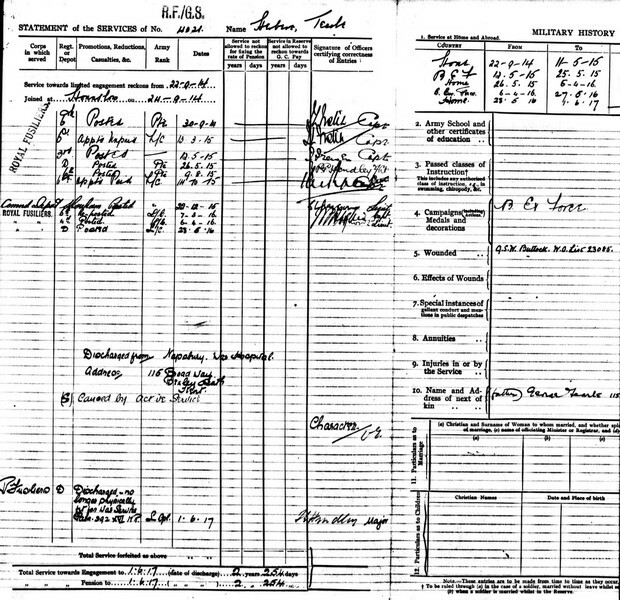 In the same 1911 census, Herbert was at school, 12yrs old. On 22 Sep 1914, at the Hounslow recruiting office, Herbert joined the Royal Fusiliers on a Short Service attestation as “Three Years with the Colours,” unless the war lasted longer than that, in which case “you will be retained until the War is over.” This is the same London regiment that Arthur Walter Tearle joined, except that Arthur was a Territorial in the Royal Fusiliers (City of London) Regiment, and Herbert has joined the Royal Fusiliers as a regular, but none-the-less a member of a London Royal Fusiliers regiment. He said – and they believed him – that he was 19yrs old! He was 5ft 11″ (very tall for the times) with a scar on his left knee, fresh complexion, 132lbs in weight, blue eyes and black hair. He gave his religious denomination as “Congregational” but he must have picked that up in London, because his father was baptised on the Dunstable Methodist Circuit. He was given the Regimental number 4021 and he was initially inducted into the 6th Battalion. “In the event of my death I give £6-6-0 (six guineas) to my mother Elizabeth Tearle and I give my remaining property to my father George Tearle. His service record has a number of interesting highlights, but the page below tells most of the story. 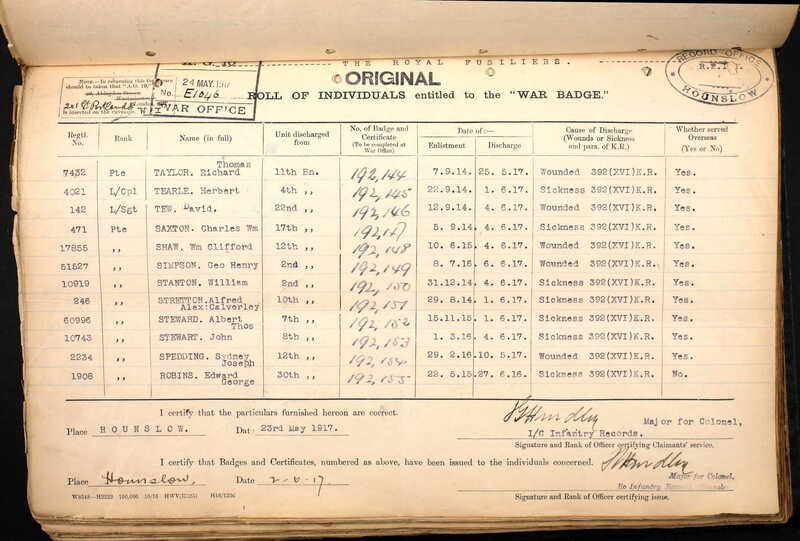 You can see when he became a lance corporal, lost it, then regained it, as well as his very short stint (only 14 days) on the Western Front. Why he was returned to Home (which could have been anywhere in England, Wales, Scotland or Ireland) I cannot fathom. The Royal Fusiliers went to Egypt in October 1915 and then Salonica in December. Herbert joined them on 6 Apr 1916. He was wounded on 27 May 1917 and returned Home. You can see that he spent some time in Napsbury Hospital, near St Albans. West Wing, Napsbury Hospital, St Albans. Herbert John Tearle WW1 Silver War Badge. In the 1920s he was sent the 1915 Star, the British Medal, and the Victory Medal. If you review the story of Arthur Walter Tearle, you will see Herbert’s Royal Fusiliers and the 2nd, 3rd and 6th battalions written on the Cornhill War Memorial. Now, there is an odd codicil to this story. 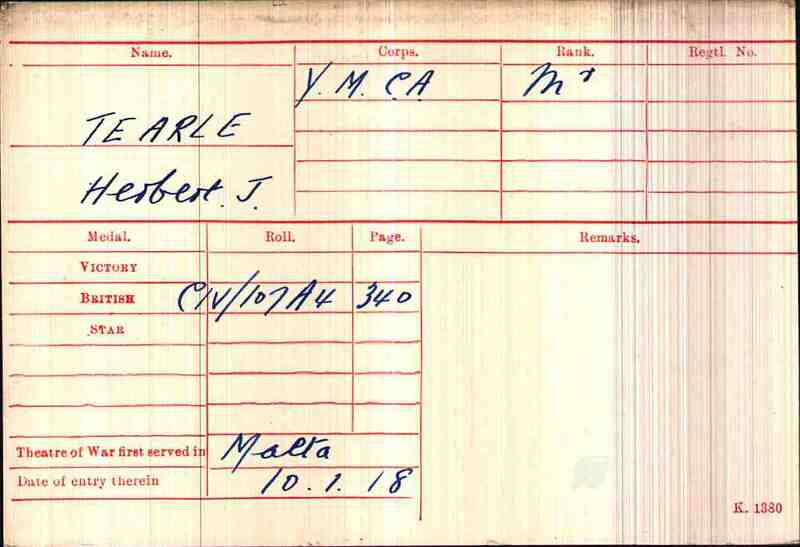 Wounded as he was, and invalided from the army, Herbert joined the YMCA and sailed for Malta, arriving there on 10 Jan 1918, still in the heat of WW1. The hospitals of Malta tended to the wounded of two major campaigns, the Dardenelles (Gallipoli) from 25 Apr 1915 to 8 Jan 1916, and then the Salonica Campaign, when the Allies gave support to Serbia in its war with Bulgaria, from 5 Oct 1915 to 30 Sep 1918. As far as the YMCA in Malta is concerned, it is difficult to find any documentation of their activities. However, as early as 1916, a YMCA marquee was erected for the treatment of malaria and dysentery in patients from the Salonica Campaign, in the grounds of St Pauls Camp, Hutment Hospital. Although it is known that the YMCA in Malta existed during the time that Malta was a British colony, this YMCA activity stopped when Malta became independent in 1964. It is assumed that this YMCA activity was an extension of the British YMCA specifically geared to serve the military forces then stationed in Malta. Herbert J Tearle YMCA WW1, British Medal, Malta, 1918.